If you think tycoons are the only ones who can make big money in commercial real estate, think again. 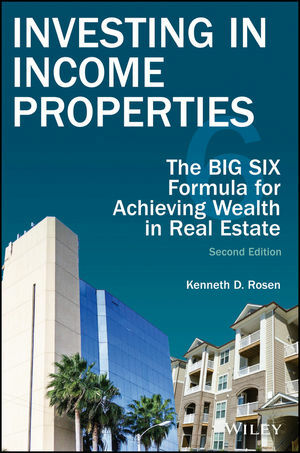 In Investing in Income Properties: The Big Six Formula for Achieving Wealth in Real Estate, real estate guru Ken Rosen lays out the fundamentals for building real estate wealth. By adhering to the Big Six, a step-by-step formula that has enabled the author to buy and sell over $500 million in investment real estate since 1975, you can take advantage of real estate opportunities and ensure your financial future. When it comes to understanding real estate investment, Investing in Income Properties stands alone for its straightforward approach and easy-to-understand explanations. It is a must-read for both beginners and seasoned pros. KENNETH D. ROSEN, CCIM, is the founder of Kendar Realty, Inc. Since 1975, he has bought and sold $500 million in investment real estate. He is a two-term past president of the Miami Association of Realtors and the recipient of numerous awards, including Miami Realtor of the Year. He has been active as a volunteer Guardian Ad Litem for abused and neglected children and is a 20-year volunteer skipper for Shake-A-Leg Miami, a nonprofit sailing center serving children and adults with disabilities. He is a 32nd degree Mason and a Shriner.